Changing a baby's nappy takes some practice: You have to know when to lift the feet, how to dodge errant streams of pee, when to abandon the wipes and plop the baby in the tub. But the absolute worst part of changing a baby's nappy? Bending over and tussling with a filthy, wiggling creature can be murder on your neck and back. Some expectant parents, either for frugality or space reasons, skip buying a dedicated changing table. I tried to forgo one for my first kid — we were trying to save money — but changing him on a low trunk was so hard on my back and knees that I finally borrowed an old dresser from my parents and stuck a changing pad on top. Having a surface at the right height (just below my elbows, say ergonomics experts) saved me a world of hurt. My husband placed a low IKEA footstool by the dresser and put one foot up to ease his own back pain (in fact, he did this while washing dishes too). To get a better idea of how to change a baby's nappy without wrecking your musculoskeletal system, I spoke to Stephanie Leaf, a physical therapist specializing in postpartum issues and the director of New Leaf Physical Therapy, for her best advice on protecting your back and neck. "When you're changing nappies on the go and at home: don't round your back and hunch over the baby with straight legs," says Leaf. "Kneel down to a lower surface or use a higher surface at about the height of your belly button. Allow your hips, knees, and elbows to bend. Softer joints allow you to use muscles more effectively and avoid joint pain from lax ligaments. Use a neutral back position to protect the discs and ligaments of your lower back," says Leaf. "When you're diaper-changing standing at a taller surface, stand close to use neutral wrist positions, have soft, bent elbows, and soft unlocked knees." I also found that rushing through a nappy change — understandable, as one doesn't want to get peed on — made me tense up. To avoid getting caught in a urine stream, I placed a new, unfolded nappy under the baby before even unfastening the dirty nappy, so the time between discarding the old nappy and fastening the new one was only a second or two. This let me take my time and concentrate on breathing and relaxing rather than clenching my jaw or tensing my hands or neck. You also want your changing supplies within easy reach — some people like a shelf above the table or the first drawer; I preferred to keep them further down the table by the baby's feet. And when the baby becomes a toddler, some people switch to changing nappies on the floor, but I found it much easier on my back to keep lifting him to the top of the dresser (your mileage may vary, of course). Need a few more tips on how to prevent pain when caring for a newborn? Here's a useful guide to setting up an ergonomic nursery — and of course, stay tuned for the next instalment in the Postpartum Pain Clinic. 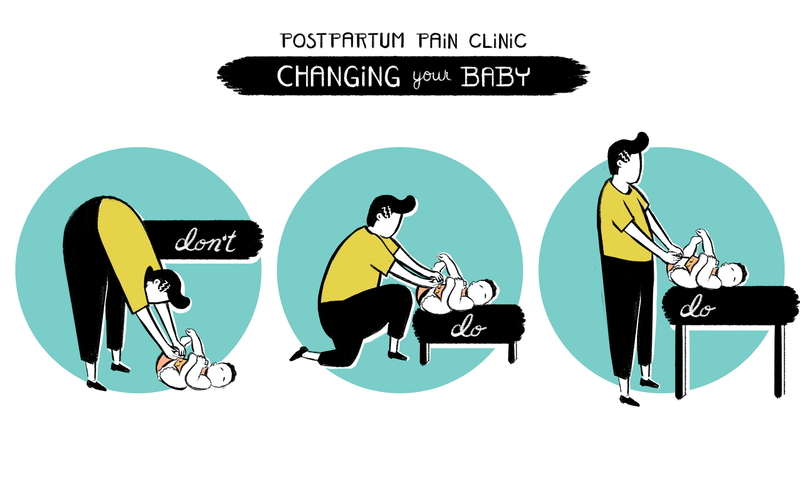 This is the second instalment in the Postpartum Pain Clinic, a multi-part series on managing the aches and pains that come along with caring for newborns and infants.